Most fluorite forms in cubes and breaks into the familiar bi-pyramidal and cube shapes we are used to seeing. 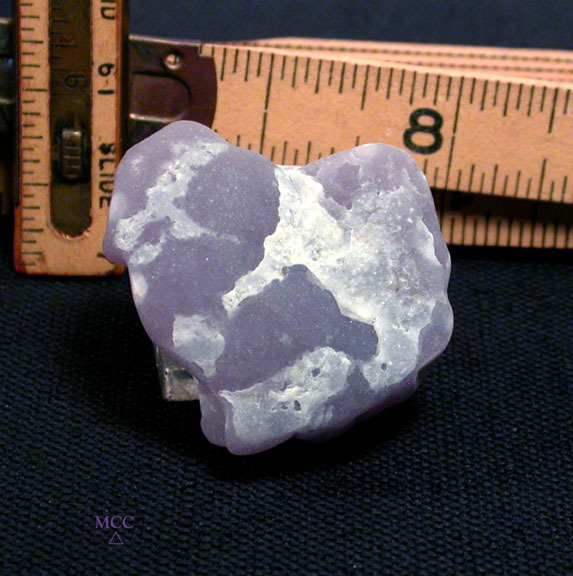 This very rare translucent lavender fluorite [var. yttrium fluorite, a rare earth inclusion] has naturally grown in a botryoidal, or rounded shape, and in a pleasingly heart-shaped and undamaged way. From Brown's Canyon District in Colorado, its' suede-like smooth to the touch and measures a set-able, wirewrap-able 1-3/4"x 1/2"x 1-5/8" tall. Of course, you may wish to display it [not in sun - colored stones will fade! - and NOT in plastic, either!] or simply keep it by you as fluorite is held to be protective, energizing, balancing, and of course, PRETTY!